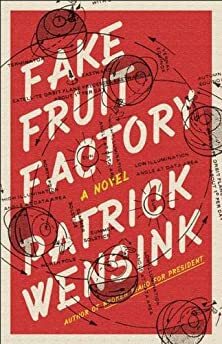 Largehearted Boy: Book Notes - Patrick Wensink "Fake Fruit Factory"
Book Notes - Patrick Wensink "Fake Fruit Factory"
Patrick Wensink's Fake Fruit Factory is a hilarious and thought-provoking satire of small town American life. "It's an overstuffed buffet of a book, but Wensink keeps it fresh. He's also making a statement about America as a whole, both satirically and sentimentally: The satellite that's on a collision course with the anachronistic town of Dyson might as well symbolize the future. Ultimately, Fake Fruit Factory is a microcosm of an entire nation having to come to terms with the skeletons of yesterday, not to mention the fears of tomorrow. It's Wensink's warped world, but there's no denying we live in it." Fake Fruit Factory chronicles the bizarre downfall of the Most Boring Town in America: Dyson, OH. Why Ohio? That's because I have a firm belief that most novels are better when they take place in my childhood home state. Forget West Egg, I want to see a Great Gatsby set in West Cleveland! What if Joan Didion's Play it as it Lies stepped it up a notch and explored the soullessness of the film industry around Toledo? Now we're talking! Catcher in the Rye...I think we've all wondered what kind of shenanigans Holden would have discovered wandering around Cincinnati, right? Am I pandering to the locals of a website named after a Guided by Voices song? Maybe. But this tune penned by Datyon's finest group of middle-aged basement pop stars should replace "Hang on Sloopy" as Ohio's official rock song if I have my way. There's something wonderfully Midwestern about how depressing it seems at first but eventually turns that sadness into a kind of victorious optimism. The Rust Belt in a nutshell. Brainiac is like a lot of things I love about Ohio, they are hidden from most of the world. Probably my favorite Ohio band, they were so weird and catchy and ahead of their time most music nerds still only know whispers about them. Brainiac's style--the sound of analog technology crashing --is a good fit with Fake Fruit Factory's core threat of a crashing NASA satellite that may wipe America's Boringest Town off the map. Once in a while that Ohio quirkiness leaks out into the culture at large, which is exactly what happens in Fake Fruit Factory when America's 24-hour news cycle latches onto doomed little Dyson, OH. The fact that Kim Deal's humongous alterna-hit was so full of Midwestern weirdness is proof positive that once in a while there is still magic in this world. I am cheating a bit. Arguably one of the most innovative saxophonists in history spent much of his life in Cleveland, though he lived in New York, too. Regardless, he had a fascination with honking free jazz and spirituality that ran through all his work. Fake Fruit Factory jumps on Ayler's bandwagon in that regard with one character, a former TV commercial actress, who caught the jazz bug while living in the big city. Also, the idea of ghosts (both real and of our past) literally run amok in the book in the form of a mysteriously generous mummy.